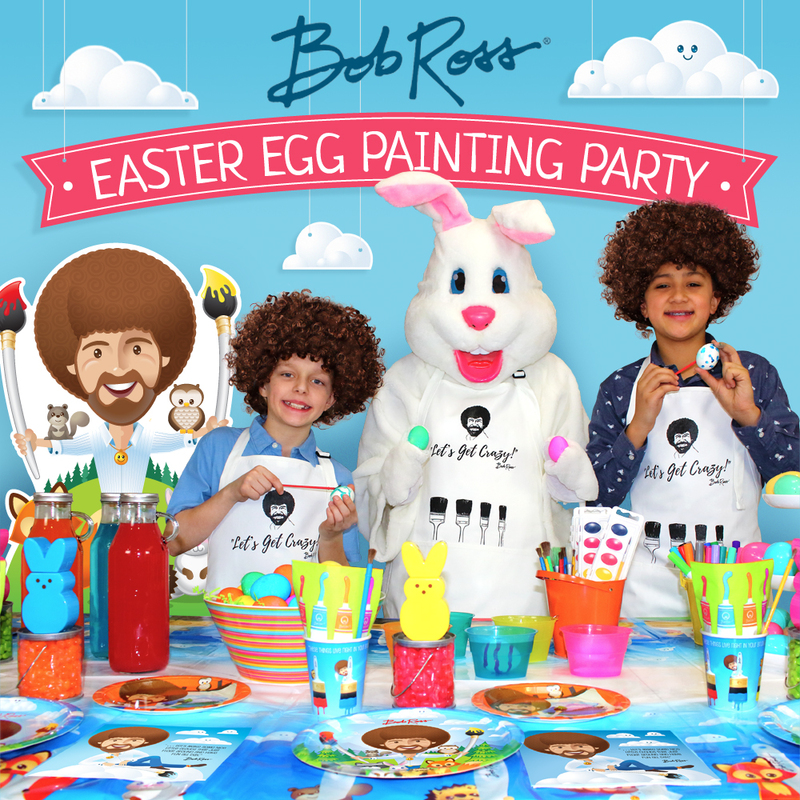 Bob Ross, well-known for his artistic abilities and teaching art classes on TV has stepped foot in our homes with his outstanding funny birthday party supplies and big hair! Now you can enjoy Bob Ross Free Activity Printables for parties or just because. Be sure to see below how to conduct The Bob Ross Challenge. My affiliate links are provided in this post, so you know exactly where to get all your Bob Ross party supplies. If anyone were to buy products using my link at no extra cost to you, FGM would receive a small commission. What I’ve learned about Bob Ross is that he is very popular among young kids, teens and adults alike. My 9-year-old hadn’t heard of him until now, but his art teacher and the 4th & 5th graders at his elementary school have heard of him. They even wear his t-shirt to school. Bob Ross is new to me too. I asked my husband who he was and he told me that he grew up watching him on TV teaching people how to paint. I didn’t think I lived under a rock, but now I think maybe I do or did!! Have you heard of Bob Ross? Just click on the free printables below to get yours, then you’ll be one step ahead of all the fun. 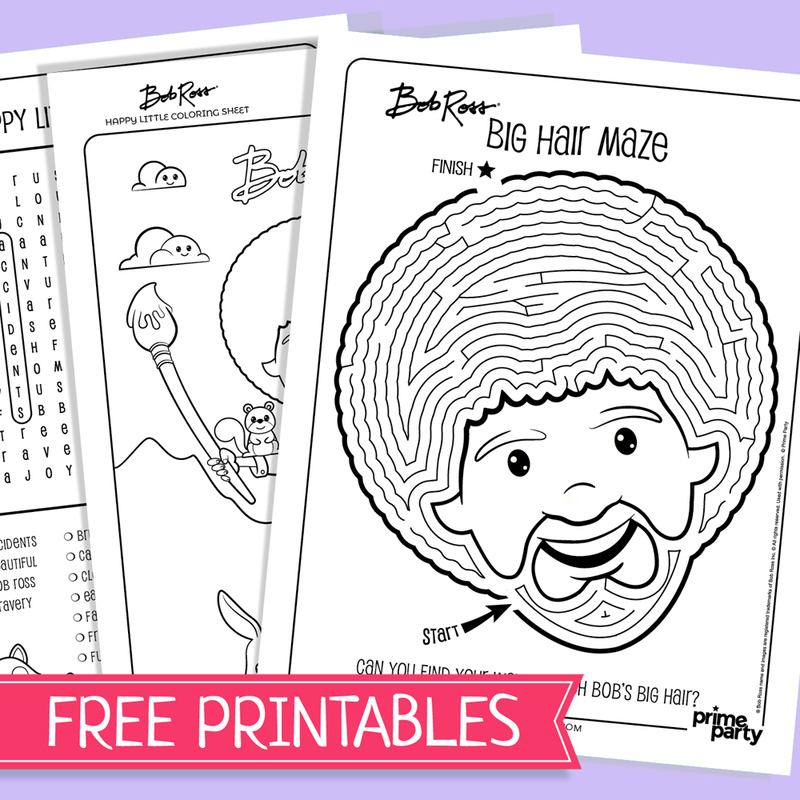 Your big adventure just came true with Bob Ross free activity printables. Have fun!! This type of party is the “NEW” way to showcase the way young adults are celebrating using the Bob Ross theme – it’s called The Bob Ross Challenge. You invite all your friends over, have paints and canvases set up for everyone. The host plays a Bob Ross video on the TV (without pushing pause) and sees who can paint along with Bob and keep up. The real fun is the reveal at the end where everyone shares their paintings. Different awards are generally given out to all participants so no one would feel left out. Optional of course. Doesn’t this sound fun? This party could even be done with smaller children and finger paints. I could also see this as a backyard party with a projector and a sheet to keep the mess outside. What do you think? Are you ready to order your Bob Ross and Friends Party Supplies? Go for it! It’s a Jurassic World Out There! Ohh, I love the free printables! Perfect for my kid that is currently learning to color. This is indeed a great way to have some fun and learn with the kids. I grew up watching Bob Ross and I’m a huge fan of both his paintings and him as a person. I’m going to share this with my cousin so she can introduce her daughter to him as well. I’ve never heard of Bob Ross but I love the idea and think it’s great for kids and adults alike. I have loved Bob Ross since childhood and I have family that used to paint his paintings along with The Joy of Painting. I always liked the looks of it and when I grew up I bought the supplies and started painting along with him too. Now my daughter and I do it together, so much fun, we love his commentary, rescue work, and views on life. This has to be the funniest theme for a party that I’ve ever seen. Don’t get me wrong, I think it is GENIUS. I think there are more adults than kids that would appreciate the subtelties of this them. I love the printables. Thanks for this post. It made my day!